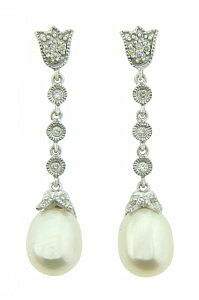 These glorious antique style earrings feature luminous tear shaped pearls. Trios of abstract blossoms dangle from a tulip shaped post, each adorned with fine faceted diamonds and delicate milgrain decoration. Fashioned of 14K white gold, the earrings are set on posts and measure 1 1/4" long, 1/4" wide.